Y'all it has been a hot minute since I did a Tasty Tuesday! I have to admit, it felt pretty good cooking for the first time in a while. This winter weather definitely calls for some hot soup and grilled cheese... can I have an amen? 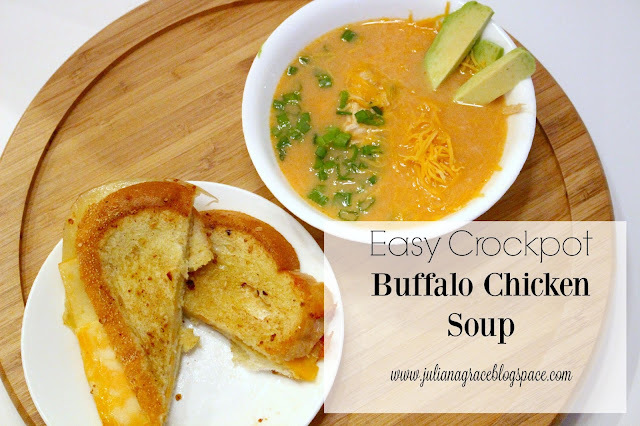 Now today I am sharing a spicy buffalo chicken soup recipe and my favorite grilled cheese to cool your mouth down! Enjoy and try to stay warm! Place the chicken, onion powder, minced garlic, and wing sauce in the crockpot. Cook on high for 10 minutes and then on low for 6-8 hours. After this amount of time, shred the chicken breasts apart using two forks. Mix the heavy cream and cornstarch together in a separate bowl and then add to the crockpot before cooking for the final 20-30 minutes. Dish soup into bowls and top with cheese, green onions, and a slice or two of avocado. Enjoy! In a saucepan, melt your butter, garlic, red pepper flakes, and thyme. Let simmer while assembling sandwiches. Lay your slices of break out and spread 1/2 teaspoon of mustard onto each slice. Then layer a slice of each cheese on top of one slice of bread and place the second slice of bread on top to make a sandwich. Using a pastry brush, brush the butter mixture onto the top and bottom of all the sandwhiches before placing in a separate heated skillet. Cook each sandwich until both sides are brown and all the cheese has completely melted. Enjoy! Enjoy the rest of your Tuesday! Talk to you very soon!